This couple wanted the simplest of weddings, and asked me if I minded if they got married in their swimsuits. Of course I didn't mind. I am a Civil Registrar of Marriages, so I am not hung up on things being done according to anything but the Cayman Islands Marriage Law. When it comes to things being done legally, then I am very strict about that, because I take my reputation and the reputation of the Cayman Islands wedding industry, very seriously. Apart from that, its your day, and you can celebrate it any way you wish, in a ceremony which is meaningful to you. 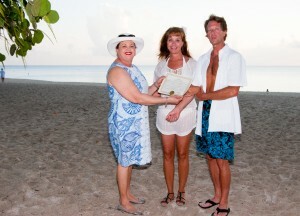 If you are staying in Cayman for a few days after your wedding, left us know because you can pick up your Registered Marriage Certificate, which is your legal marriage document from our office the next day. Otherwise we will mail it to you. The cost of obtaining your Registered Marriage Certificate, and getting it to you is included in all our packages, even or "no frills" basic wedding. They met on-line, discovered they lived within blocks of each other, and she brought him to one of her favourite places in the world, to be married.